Be sure to come by on Monday when my special guest will be Devon Monk, author of the Allie Beckstrom urban fantasy series. 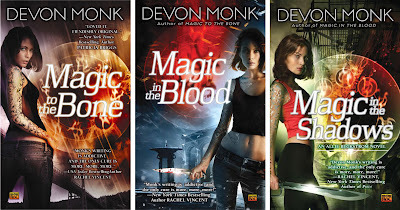 Devon will be giving away two ARCs of the forthcoming Magic On the Storm, the fourth book in the series which isn't due for release until May 4. That means an extra early preview of the next book in this exciting series for two lucky winners! "Magic stirred in me....I closed my eyes, wanting to lose myself to it. Wanting to use magic in every way I could. But that woudl be bad. I had enough magic inside me; I could burn down a city. And I didn't wan tot do that...."
Allie Beckstrom knows better than most that when magic's involved, you always pay. Whether the price is migraines, amnesia, or muscle aches, she is committed to her work as a Hound, tracing illegal spells back to their casters. But her job is about to get much more dangerous. There's a storm of apocalyptic force bearing down on Portland, and when it hits, all the magic in the area will turn unstable and destructive. To stop it from taking out the entire city, Allie and her lover, the mysterious Zayvion Jones, must work with the Authority--the enigmatic arbiters of all things magic--and make a stand against a magical wild storm that will obliterate all in its path. Haven't come across these books before. 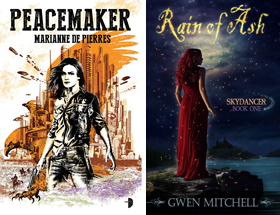 I'll be adding them to my tbr list! i keep seeing people talk about these and they are kicking around the shops, but I haven't invested yet. I feel myself weakening. Devon Monk is one of my favorites. I've read all of her books so far. I gave the first one away, and then when the second one came out, I ended up buying the first one again, because it felt weird not to have it. So far I haven't had the pleasure of getting close and personal with these books, but I look forward to the introduction seduction. Thanks for the inspirational review.